Greater Manchester is a metropolitan county and urban City Region in North West England. Greater Manchester spans one of the United Kingdom's largest and most vibrant metropolitan areas, and has a population of 2.6 million. 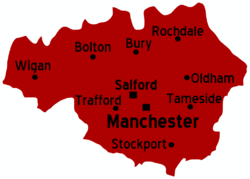 It is composed of ten metropolitan boroughs: Bolton, Bury, Oldham, Rochdale, Stockport, Tameside, Trafford, Wigan, and the cities of Manchester and Salford. Each borough contains a district centre of at least regional importance, while Manchester city centre and the adjoining parts of Salford and Trafford, form the cultural, economic and social focal point of the 493 square-mile (1,277 km2) City Region, and of much of northern England. Tourist attractions include Old Trafford (the home stadium of Manchester United F.C. ), the Trafford Centre (one of the UK's largest), and Salford Quays. Greater Manchester has the benefits of an orbital motorway (the M60), which provides the City Region with first-rate road transport links and a nationally important airport (Manchester Airport). Public transport is managed by Transport for Greater Manchester (which is the only body in the UK that has powers comparable to Transport for London), which provide the City Region with a variety of public transport options for navigating places from the Peak District and South Pennines to the noisy, vibrant and truly multicultural hub of Manchester city centre. Greater Manchester’s Metrolink network is one of the most successful light rail systems in the UK, carrying nearly 20 million passengers every year (as of 2011), and is undergoing a major expansion such that several new lines of track are being laid and intergrated into the system. Most people staying in Greater Manchester will be based in the city itself so much of the information needed for Greater Manchester can be found under Manchester or links to other towns or districts in the conurbation. This page was last edited on 12 April 2016, at 07:13.